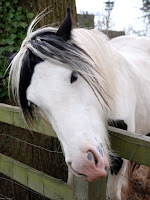 mike downes - we make videos to help people learn: The Paddock in Castle Road - Could the Ponies be back? The Paddock in Castle Road - Could the Ponies be back? It was nearly two years ago that saw passers by enjoying the ponies in The Paddock in Castle Road. But, since August 2009, the area has been empty. Biodiversity has flourished - but the ponies could be back after the hay cut in August. Warwick DC confirmed today that negotiations are in an early stage that could see grazing return to this popular site at the far end of Abbey Fields. In the meantime, for those who missed it, are two newspaper clippings (background reading), two aerial maps, the paddock as it looks today and plenty of photos of the ponies that once were.